Paul Black, a Madison Scouts mellophone player, sent this one in. 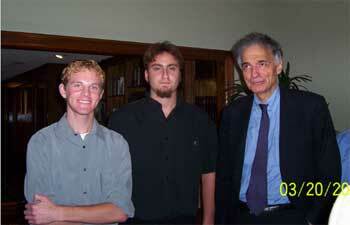 "This is a photo of (from left to right) me (Paul Black, mellophone), Rowan Sbaiti (baritone), and Ralph Nader. Rowan and I marched in the 2003 Madison Scouts. Ralph Nader's campaign manager is good friends with Rowan's father, and as a result, Nader came and ate dinner at Rowan's house. Many prominent businessmen from the metroplex were there as well. Meeting Nader and hearing his stance on various issues was very interesting. He took time to answer everyones' questions and give a short speech in the process. We had a great time." Thanks Paul! This is by no means a political endorsement.